There’s a lot that goes into the creation and management of a successful online community: the technology platform, the community manager(s), the marketing and audience generation strategy, the content quality, and much, much more. We're honored that Evoq Social received the Critic’s Choice Award for Best Social Networking Solution from CMS Critic. While “social networking solution” can mean many things to many people, I think the Critic’s Choice judges like that Evoq Social not only provides a complete online community solution, but it’s also integrated with our Content Management System (CMS), Evoq Content. This means that your online community doesn’t have to live on an island. Instead, your online community and your website are one and the same. But that’s enough on the technology component. Technology, while important, must be complemented by strategy, best practices, measurement and other important activities to build and maintain a successful online community. View the Evoq Social listing at CMS Critic. Register to download the playbook. 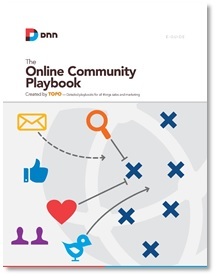 We recently collaborated with TOPO on an Online Community Playbook. We wanted to create a resource that provides community managers with a framework and set of planning tools to consider well before making a technology decision. A lot of components go into successful online communities. While the technology platform is a factor, be sure to complete your planning and strategy in advance of technology selection. Then, hire (or identify) effective community manager(s), as they are central to your community’s success. Finally, ensure that you’re ongoing management is data-driven, using metrics to gauge and track community health.